Money Never Sleeps is a tight, vigorous workout joining lucid vocals and vibrant guitar work with massive hooks and melodies. Thomas Vikstrom (Candlemass, Therion) delivers the vocals becoming critically articulate and then soaring within the same song as on 'All Because Of Me' or 'Never Again,' to name only two. Yet Covered Call is a true group effort. Therefore, no one is overshadowed or left behind. This coherency is obvious throughout, but even more so on the brilliant 'Til The End,' 'I Wanna Be Free' and 'Shine.' The first two moved me because of the near metal fret work. 'Shine,' a more AOR-like, shines because of it's amazing vocal arrangement, catchy melody, and memorable chorus. Frankly, there's little on this album to dismiss as mediocre or trivial. Even the piano driven ballad, whose lyrics could be viewed as contrived or too syrupy, was enjoyable and convincing. The only (slight) down moment is the last song 'Let's Make It Real' which is pure (and average) euro-melodic rock. Yet even this song satisfies thanks again to the fine vocals and guitar work. 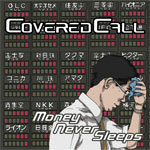 Covered Call's Money Never Sleeps is an impressive debut: great and memorable melodic hard rock with big hooks and an arena sound. With American distribution through Blistering Records, I really hope they catch on here. This band has more talent then Nickelback or Hinder could find in a sun lit room with the lights on during the Summer solstice. Highly recommended! Covered Call's Money Never Sleeps is an impressive debut: great and memorable melodic hard rock with big hooks and an arena sound. With American distribution through Blistering Records, I really hope they catch on here. This band has more talent then Nickelback or Hinder could find in a sun lit room with the lights on during the Summer solstice.